Using the same game play as the Mini-Getaway game played in Stockholm from last year (Monterosa, the same digital agency is behind both), New Balance has launched a augmented reality game in New York City dubbed the Urban Dash. Each week day New Balance will release 20 virtual batons (10 on the weekend) at various locations throughout the boroughs of New York City. The batons are released sometime between 9am and 5pm, with the exact time revealed on the New Balance Twitter and Facebook pages. After players download the app and register they are ready to play. Players then use the Google Map within the app to locate the virtual batons, then get within 100 feet of the baton in order to claim it. Once they have claimed the baton they must get to the NBNY store at 150 5th Avenue to claim their prize. But it would be no fun if it was that simple, other players can steal the baton once they get within 100 feet of current owner. I’m not sure what prevents unscrupulous players hanging around near the HBNY store and simply swiping virtual batons as people approach. It would be interesting to see a ‘safe zone’ several blocks around the store to help minimize this. If you lose connectivity or power to your mobile phone you have effectively dropped the baton and others can grab it at the last location it was connected at. Players receive a special pair of NBNY exclusive shoes for their first win and a $75 NBNY gift card for their second and third baton wins. The player with the most baton wins by the end of the game on September 10 is eligible to win a special gold baton worth approximately USD $20,000. This is a pretty solid initiative, the baton fits in well with the serious runners that make up New Balance’s customers. 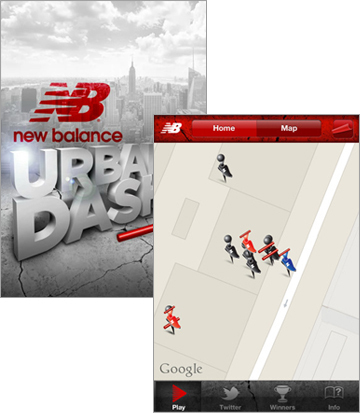 The New Balance Urban Dash app is available in the US iTunes store. This summer a few lucky Londoners have been invited to a very special immersive experience commissioned by Stella Artois and orchestrated by Felix Barrett and the Punchdrunk Theatre Company to promote their Stella Artois Black Lager. The same partnership produced a similar immersive experience last year called The Night Chauffeur. In early July, invitations were sent out to people in London to attend a special party. Invitees knew when and where to go but not much about what they were about to experience. Guests arrived at the warehouse is Shoreditch, East London, which had been designed to look like a Paris family home in 1963. 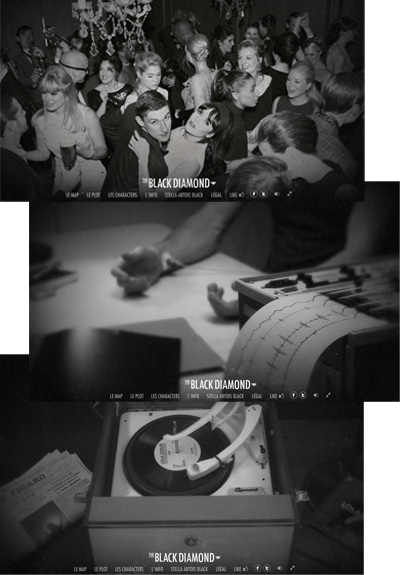 Besides the invited guests, the party included a number of actors playing roles within the Black Diamond storyline. It turns out the party is being hosted by a young diamond-cutter named Jacques Ferre, and that night he is set to give his girlfriend Cecile a rare black diamond. Later at the party a man is chased from the room by Jacques. It turns out that the black diamond has been stolen and Jacques shouts to the crowd of guests asking if they had seen anything. The party is brought to an abrupt leaving the guests in a state of confusion. A few weeks later the guests are summoned to a secret location in small groups to play out the remaining six scenes in the story. The scenes played over the next hour at several locations as guests interacted with actors playing the various characters in the story. If you’re curious whether there was a happy ending you can read a first-hand account of the Black Diamond experience by the folks at DesignBridge. For the rest of us not lucky enough to be involved personally in the London experience, we can follow the story at the Stella Artois Black Diamond website. The site was created by London agency Unit 9. Cossette Vancouver and McDonald’s Canada came up with a ‘cool’ way to promote Dollar Drink Days in Alberta. 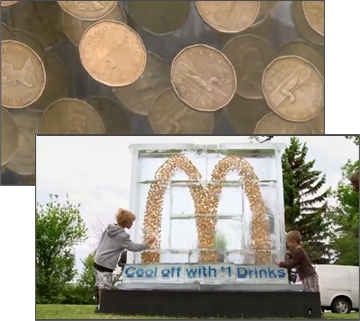 They created an ice sculpture embedded with 4,000 loonies (Canadian dollar coins) in the shape of the golden arches logo. The ice sculpture was reassembled in a park as part of a “beach party” with a DJ, hula hooping and limbo contests near theSylvan Lake Pier (near Red Deer, north of Calgary). People passing by needed little encouragement to start chipping away at the ice to get to the coins. Within just 5 hours the ice had melted and all 4000 coins had been claimed. This is a great example of a unique, yet straightforward experiential brand promotion. I’m sure more than a few of those loonies found their way to the locals McDonald’s Restaurant a few blocks away. Daily deal site LivingSocial has created its own version of CashCab, it’s the LivingSocial Taxi. In this campaign played out in London cabs, passengers are given the choice to continue to their destination or roll the dice to win a special LivingSocial experience. The experiences included driving a luxury car, cooking demos, wildlife experiences, pole dancing fitness sessions and even a fish pedicure. Would you continue on with your trip or take a chance on adventure? Tetley Canada wants to provide a break to those monotonous everyday routines we all face with their new Infusions product. To promote this idea they took over a Cousins Market right here in my neighbourhood here in Port Credit, replacing the ‘everyday’ shopping carts with a group of ‘sharp-looking’ shopping butlers. It’s a lot fun to watch the variety of reactions of people as they approach the store. 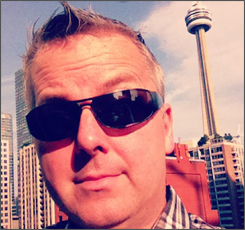 The campaign was created by Toronto’s John St., and includes a contest to win a trip to Toronto and a visit to the set of CBC’s Being Erica. More details are available on the Tetley Canada Facebook page. ‘Inside‘, an ambitious interactive film project sponsored by Intel and Toshiba, featuring director D.J. Caruso (Disturbia) and starring Emmy Rossum (of HBO’s Shameless) launched yesterday with it’s first installment. 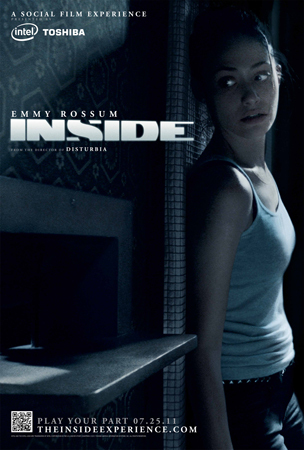 The first clip opens with Rossum’s character Christina waking up in a strange sealed-off room. Within that room is a Intel-powered Toshiba laptop (not surprising) with intermittent access to an untraceable web connection. Eventually Christina uses the shiny new laptop and dicey connection to ask for help from her friends through her Facebook, Twitter and YouTube accounts. Viewers are invited to help Christina solve the clues to her location and the reason she’s been confined to the room. The contributions of viewers that best fit the storyline will be included in upcoming installments and will help shape events within the series. On the first day, Christina’s Facebook wall featured posts from dozens of viewers as they debated the significance of a receipt and torn pieces of a Chinese food menu. One interesting clue came from a closeup of a piece of torn wallpaper featuring the name of the manufacturer. That clue led to the Acorn Wallpaper Company website, where viewers learned that these were Chinese-made wallpapers that were only imported through Los Angeles. Was this a clue to Christina’s location? Viewers could also get involved as actors. An open-casting call ran from July 11-20 inviting viewers to audition via their webcam. The selected viewer will be featured as a character in a future installment. The Producers have made a good effort to keep the the production’s website and social accounts separate from those of the main character. Keeping the fourth wall intact even on Twitter, Facebook and YouTube can be a challenge especially with the character responding to viewers. You can catch find links to all the clips and accounts at The Inside Experience, as well The Rules of Inside on Facebook. 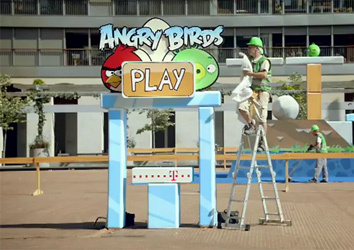 On May 11, in a promotion for Deutsche Telekom, Saatchi & Saatchi U.K. teamed up with game-maker Rovio to create a real world version of the wildly popular mobile game Angry Birds in Barcelona, Spain. A mobile phone in a kiosk acted as the game controller, launching the birds out of the digital display and crashing them into the real-world structures. You can read more about the mechanics of the experience in this Creativity interview with Greg Brunkalla of Legs, the production company tasked with creating the real-life version of the game. After watching the video, the iPhone version of Angry Birds seems a little tame. ‘The Cheating Wall’ located at the TIFF Lightbox is allowing Toronto pedestrians walking on King Street West to catch a live video glimpse the action on Maisoneuve Boulevard in Montreal. It’s certainly a fun way to create curiosity and encourage folks to visit each other cities. The message on the wall reads, “It’s OK to cheat on your city. Pay Montreal a visit live, right here”. Torontonians can not only get a peek at Montreal, but they can join in daily events including a lunchtime dance-off, a long distance dinner party and even a 505km fashion runway event. A full schedule of events can be found at the Visit Toronto Facebook page. It’s unfortunate that’s it’s so tough to see anything in the window during the day, but the video is running 24/7 until June 15th, so there’s a lot of opportunity for some fun interaction between people in both cities after dark. 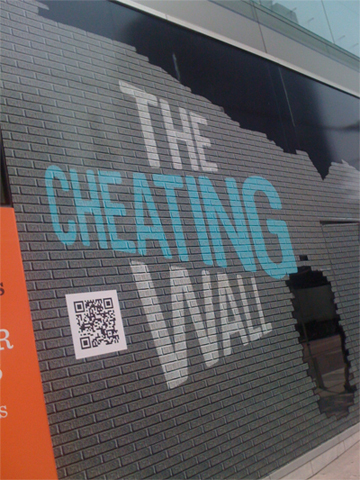 Creative for the Cheating Wall came via the Toronto offices of Crsipin Porter + Bogusky’s Toronto office, with Smak doing street-level promotion and Monster Media handling the technology. If you’re curious about the QR code in the image. I can confirm that it quickly and efficiently loads a schedule of the daily events.